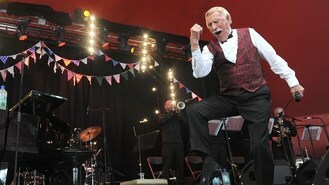 The entertainer brought a crowd of thousands to the Somerset festival's Avalon stage, with the queue outside the tent ten deep as fans tried to get inside. He was welcomed by chants of "Brucie, Brucie" as he danced his way on to the Strictly Come Dancing theme tune. At the age of 85, he is one of the oldest performers to ever play at Glastonbury and festival-goers, some wearing masks of his face, were delighted by Sir Bruce's hour-long set, which saw him singing, tap dancing and playing the piano. Speaking backstage, he said the audience's reaction was overwhelming. "You can only be as good as your audience - and they were incredible," he said. "We were getting laughs where we don't usually get laughs. They were sensational. "I'm a bit shocked now because I didn't expect it to affect me so much. It was so emotional at the end; I wanted to grab them and give them a big hug because they were so happy and so friendly. I hope they weren't all kidding or being polite!". The entertainer admitted he had been nervous ahead of the show, seen by some 2,500 people, but that he was delighted to have been asked to play Glastonbury. "I felt the same as Mick Jagger. He wasn't asked before either," he joked. He said of the show: "This is one of the biggest performances of my life. That's easy to say because it's absolutely true. "I've had some great moments in television and theatre but this was special because it's a different kind of audience. It almost had a family audience feel, which is what I grew up with when I did summer seasons."